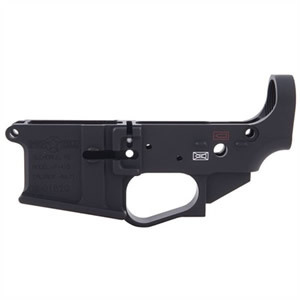 POF 308 AR Stripped Lower Receiver, semi-auto lower receiver is fully machined from U.S.-sourced 7075 T6 aluminum billet for superb strength and precise dimensions. Extra metal in the right places gives a big payoff in added support and rigidity with minimal extra weight. Available in AR-15 and AR-style .308 sizes, both models accept mil-spec and aftermarket components, so you can select the upper, trigger group, pistol grip, receiver extension, and buttstock that best serve your needs—the perfect foundation for a custom tactical rifle. Integral, oversized trigger guard machined as part of the receiver further enhances structural rigidity and provides plenty of clearance for trigger finger when wearing gloves. Radiused inside and outside edges protect finger from cuts and scrapes when mounting weapon quickly or during extended fire. Flared magwell with smoothly radiused inside corners helps ensure fast reloads, without fumbling, when seconds count. Cut for ambidextrous bolt release to allow strong- or weak-hand operation; right-side button included with receiver. Laser etched, international “fire” and “safe” symbols give the operator instant, intuitive feedback on the weapon’s safety status in high-stress situations. Mil-spec hardcoat anodized for additional surface strength and corrosion resistance. P-415 is available with a durable, low-friction black Teflon® finish or a tough, gray NP3 electroless nickel/Teflon outer coating that’s highly resistant to surface wear. NP3 is exceptionally thin, hard (Rc 48-51), and self-lubricating, so it prolongs weapon life by minimizing wear fouling buildup. P-308 is available with NP3 finish only. All heat-treatment, plating, coatings applied by U.S.-owned and operated contractors. Click here for purchasing info.